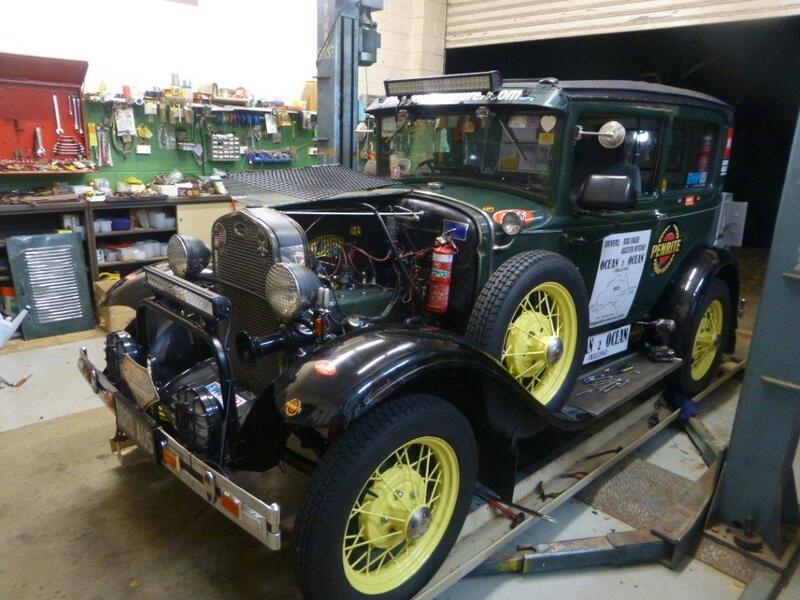 With just eight days to go, Rod has his worked cut out for him to get the 1930 Ford Model A aka Tudor Rose all ready for the off on Tuesday 3rd June at 10am from Surfers Paradise when its starts the mammoth Ocean 2 Ocean Challenge – Australia. “Here is how my day went – Tudor Rose was back together and I was driving her around at great speed and up mountains and around corners and was smiling to myself that the previous days horrors were over and then I woke up…it was 2.43am!!! When I finally did arise, I showered and fooded up and I started to live my dream and worked all day on Tudor Rose. Co-driver Austen arrived after lunch and the two of us nearly finished putting the lady back together before the sun went down and we pulled the pin. 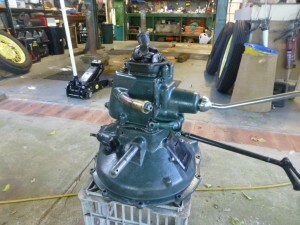 9am – Gear box overhaul completed and bolted back onto the bell housing ready to be fitted back into Tudor Rose. I lifted it back in with a little help from my daughter Louise. She would be a mechanic if I would let her but Louise is my wife Nola’s dialysis nurse. Nola dialyses at home. I love these girls, Tudor Rose included. 5pm – Gear box bolted back in and the rear axle reconnected…a real hard day and a lot of work. These Model A Fords can be a handful to work on but for me it is a labour of love but hard love sometimes. It is a bit like life, you only get back what you put in. Tomorrow I will finish off the work and do a test drive and be ready Tuesday morning to go on the dyno. I have to have all this done by 10am tomorrow because it is my turn to “go over the hoist.” I am due for a full check up as I do before I take on such drives as the o2o OZ. I need to know that I am as fit as I need to be and I am in as good a condition as Tudor Rose. If no issues show up on the dyno on Tuesday that we can’t solve there and then Tudor Rose will be ready for a suds bath and tart up, ready for the big day. Me too!!! Sometimes I wonder if I am too fussy, we could have left the gearbox as it was and just kept topping up the gearbox on the run through the hatch in the floor but I just can’t bear to see drops of oil under my cars. I will start the o2o OZ now without having the gear box oil thing on my mind. There are thousands of Model A Ford owners that will tell you that these cars were/are the best oil spreaders ever and if there was no oil running out of them from somewhere that meant there was no oil left to run out!! !